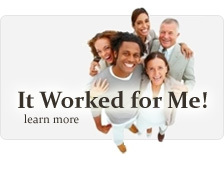 Atopic eczema attacks males and females alike, and although it is shown to have strong inherited tendencies it will often occur in families where no history of the illness has shown itself before. Although more prevalent in urban and industrialized areas, the disease is endemic the planet over. Predominantly displaying behind the knees, in the creases of the elbows and on the face, the dry reddened, itchy skin can become so severe it can cover the patient's entire body. It is estimated that one in ten people will display symptoms at some time in their lives, even if no familial link can be found. Eczema in children is extremely common, and although often it will fade through childhood, for many the symptoms remain through to adulthood. Often the sufferer will also display more latent symptoms such as eczema on their eyelids, breakouts of eczema on hands exposed to chemicals especially cleaning detergents, and periodic bouts of dry, flaky skin. For many people extreme temperatures can act as a trigger for the disease. Hot sunny days can result in eczema breakouts on the face, as can blushing or embarrassment. By the same token as winter begins to creep in dryness can be very sore too. A pair of good gloves are a brilliant weapon in the winter fight against eczema on hands, especially tiny ones. With all symptoms there is the common theme of scratching which can be extremely upsetting. In extreme instances of eczema in children it can be necessary for protection from cotton gloves less likely to break weakened skin. Eczema in children brings the added danger of infection being rife in broken or open skins. Skin becomes far more brittle when it is dry and if the patient has been using an eczema cream prescribed by the doctor, the skin will be even more delicate. The standard eczema treatment is cortisone, whether taken in the form of a steroid pills or cream. Short term this can be a highly effective treatment but since the purpose is to strip away the top layers of skin, long term the skin becomes thinned and extremely fragile. This external layer called the stratum corneum is vital for protecting the body against infection. Eczema in children and adults alike can lead to an insidious break down of health as defenses become compromised. If that were not cruel enough, one of the main protagonists of an eczema outbreak can be down to low immunity. Coughs,colds and influenza can very quickly lead to red, itchy skin. A sad cycle of Catch-22. Diet can often offer clues to allergens which can trigger flare ups. Animal proteins, in particular dairy products, can lead to break outs. In the same way pollen or allergies to animal hair can have deleterious effects. 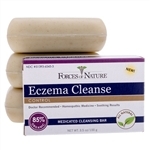 In all cases of eczema the best form of attack is defense. Maintaining a good regime of skin hydration allows it to become more supple and have a greater support mechanism when flare ups occur. 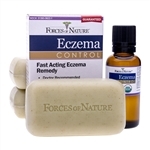 Moisturizing the skin with an effective eczema treatment protects against breakages, infection and painful unsightly the developments of dermatitis which start off as the smallest patch of red itchy skin. 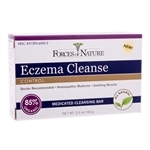 Eczema Control is a radical breakthrough eczema treatment. Unlike other eczema creams on the market it contains neither water or alcohols which can encourage the skin to attempt to dry itself even more. The blend of certified organic oils soothe and calm the itching whilst absorbing deep into the transdermal layers and into the cell membranes. Scientific research has found ointments containing triple unsaturated fatty acids encourage stronger cell growth and promote far softer, more flexible skin growth. 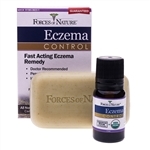 Eczema Control is a massive step in the right direction in the war against itchy skin problems. The skin is moisturized and cleansed down to the very deepest layers. On every level Eczema control has been found to be far more efficient an eczema treatment than using a moisturizing cream alone.